I know. Like, WHO AM I EVEN??? 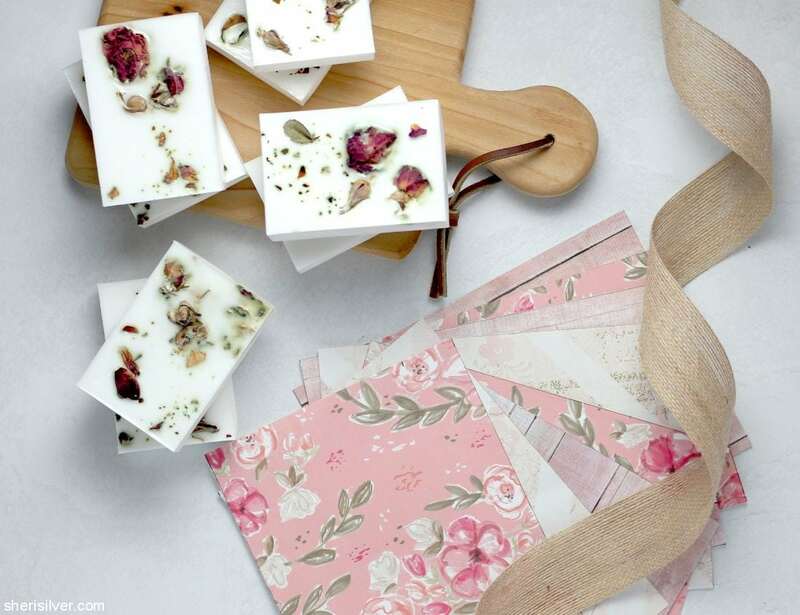 But here’s the thing – making your own soap is ridiculously easy. Especially since I ruined the first batch, and “figured out some things”, so that you can get it right the very first time. Cause I love you guys. This all started because I had to order dried roses for a cake I was shooting for a client. And let’s just say I had a LOT of dried roses left over after the couple of tablespoons I used for that cake. Dried flowers are pretty expensive, and so much like my “lavender” series of a few years back, I decided to explore what else I could use those pretty flowers for. And off to Pinterest I went. I was really smitten with the handmade soaps that kept popping up on my feed, and since I’ve already made my own scrub (two in fact!) and shower melts, I figured I’d take a look and see just how complicated making soap would be. Turns out, it’s not complicated at all! 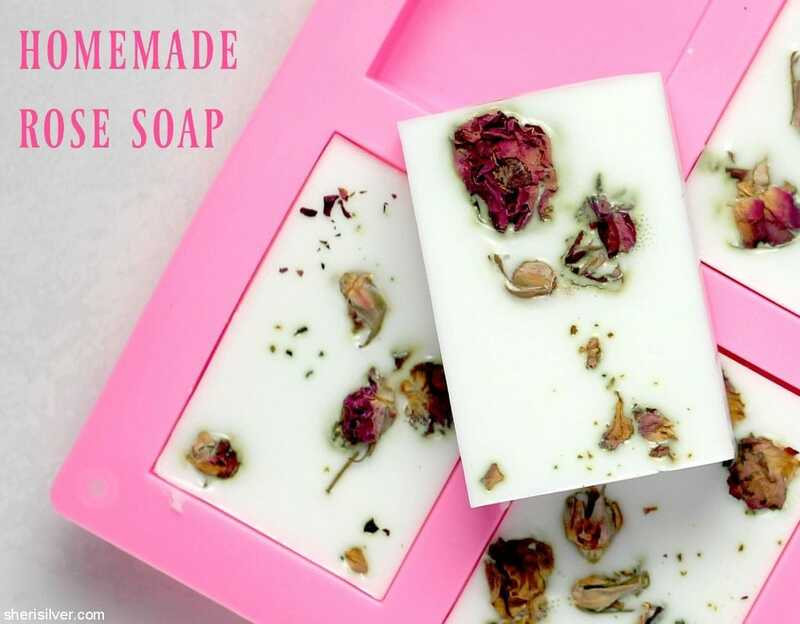 *Work in small batches – I melted the entire two-pound block of soap base at once, in a large bowl. This was messy, it didn’t melt evenly, and the soap started hardening before I was finished pouring. 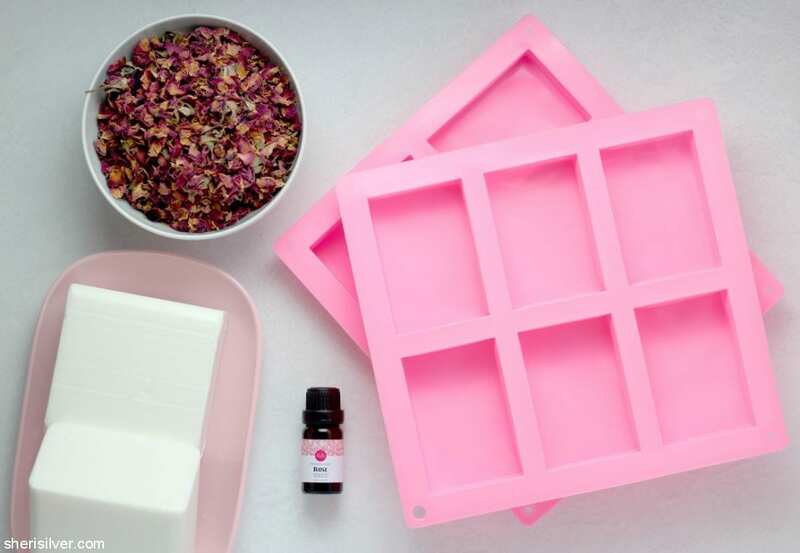 *Melt the soap in a spouted container (like a Pyrex measuring cup) – this makes for much neater pouring. 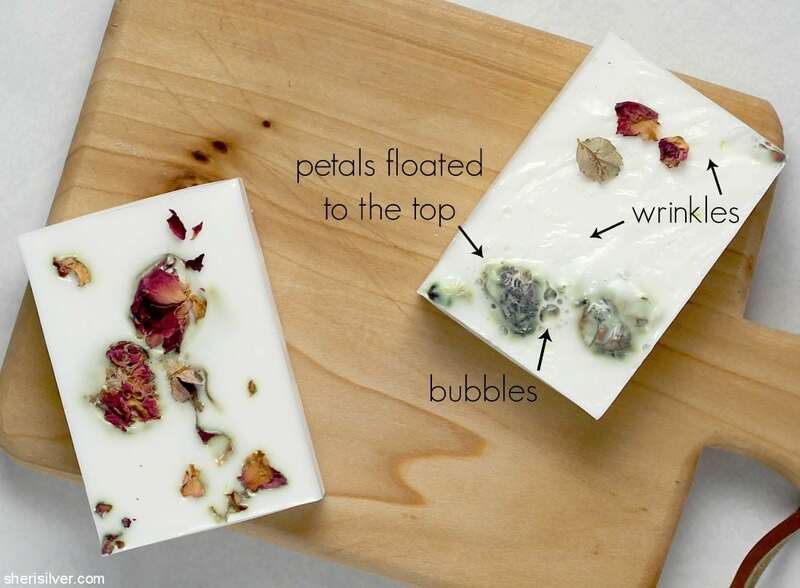 *Do not place the flowers in the bottoms of your molds – they will invariably start moving around as soon as the soap is poured in, and they’ll probably float to the surface too. You’ll then need to rearrange them, which can result in a wrinkled skin if the soap has started to set. *Have a spray bottle filled with rubbing alcohol handy – I was super bummed to see clusters of bubbles on the surface of my soaps. A quick search on this issue led to the suggestion of the spray bottle. After pouring your soap, spray a quick light mist over any bubbles – they will immediately disappear (Note: after you drop in your flowers, more bubbles may appear – which you can see on mine if you look closely. Next time I will spritz again after the petals are placed). You can clearly see the difference between my two batches. The soaps set very quickly, making this a project that can be completed in less than two hours (and with minimal mess!). 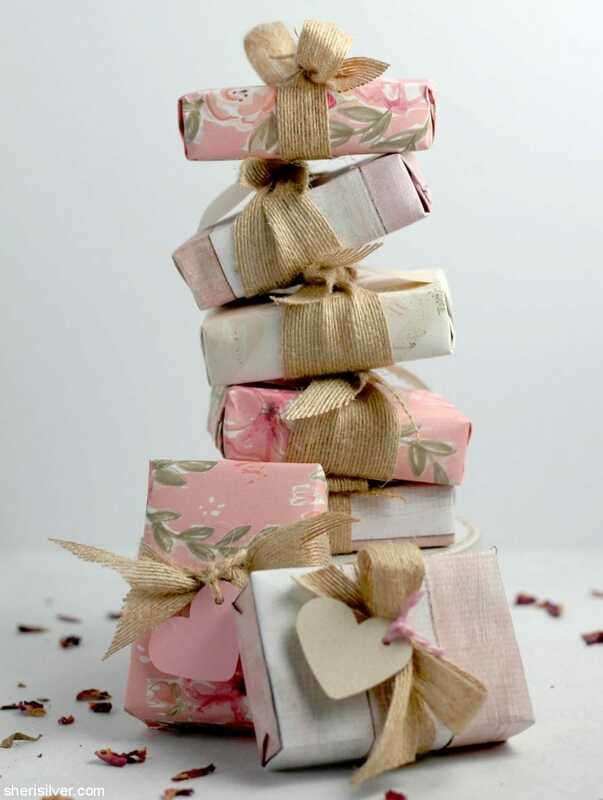 I wrapped the soaps in pretty papers to give as teacher gifts for Valentine’s Day (and kept one for myself!). Needless to say, I’m hooked – and already thinking about all the varieties I want to try next (oatmeal, vanilla, grapefruit, and yes, even lavender!). Let me know if you try these, and if you have any tips to share! Roughly chop the soap (the pieces should be about the size of ice cubes); place half in your measuring cup and set the rest aside. Melt the soap on high in your microwave, in 30-second intervals, stirring each time. When only a few chunks remain, melt in 15-second intervals, till completely melted. Add 7 – 8 drops of essential oil and gently stir. Fill one cavity with the melted soap. If there are any bubbles across the top, lightly spritz with the rubbing alcohol. Quickly place a few rose buds and petals on top. Repeat. Melt the remaining soap as above. Let set for about an hour, then remove from the molds. 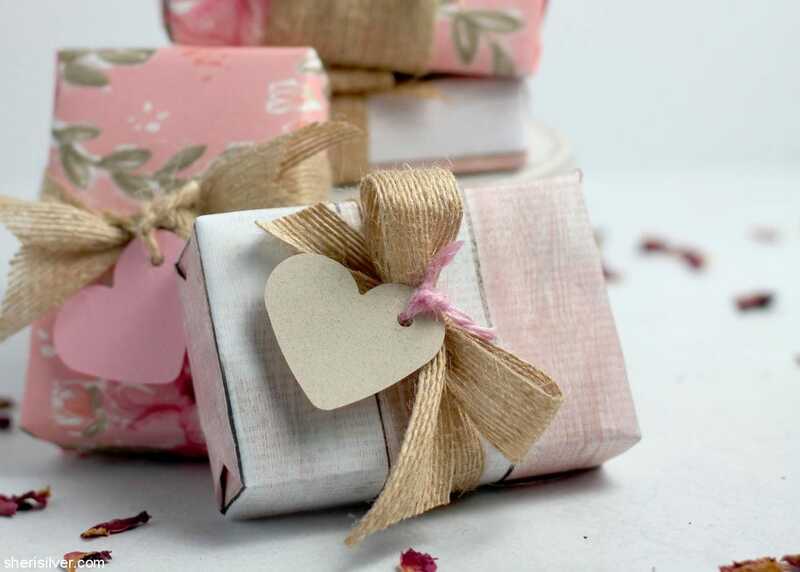 If giving as a gift, wrap in paper and tie with a ribbon. 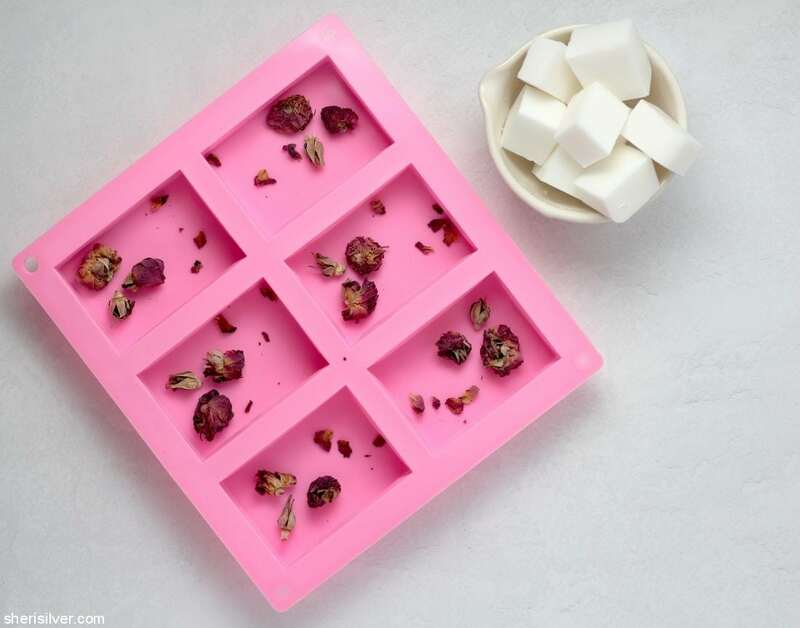 The molds I used made 3″ x 2″ bars, which each held about 4 ounces (1/2 cup) of liquid – a perfect size for gifting. But you could use any plastic containers you happen to have (from yogurt, sour cream, etc. ), muffin tins or silicone cupcake liners. Just keep in mind the capacity of whatever molds you use, so that you have enough soap base on-hand before you start. To wrap the bars I bought a few sheets of pretty scrapbook paper from the craft store (about 80 cents a piece). 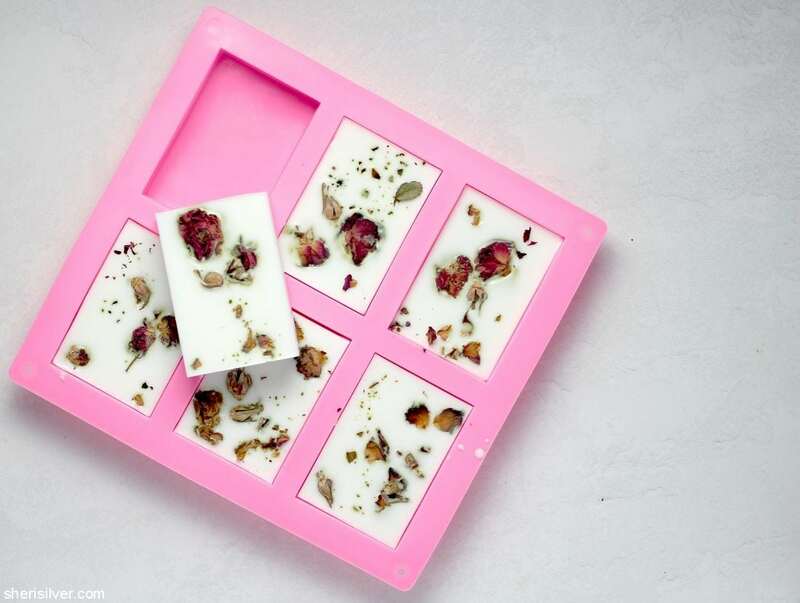 I cut sheets 5″ x 7″ which were the perfect size for wrapping my soaps. Find more handmade gifts and Valentine’s Day ideas on Pinterest!